The plant and animal species of a natural community interact in intricate ways, forming an interconnected web. For that reason, a population explosion in one species—even a native species—can cause changes that ripple throughout the natural community and beyond. White-tailed deer populations have skyrocketed in the eastern United States since the late 1900s. The population spike is due to several factors: suburbanization (which increases favorable edge habitats for deer and concentrates their breeding populations), a culturally-driven decline in hunting, and the lack of predators such as wolves and mountain lions, which lived in this area many years ago. A study at Rock Creek Park in the fall of 2013 determined that there were 77 deer per square mile in Rock Creek Park—well over a healthy forest threshold of 15-20 deer per square mile.1 By fall of 2015, after the implementation of a deer management plan, the population had been reduced to 19 deer per square mile.2 3 See Stewardship at the bottom of this page for more information on the deer management plan. 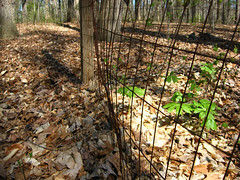 Can you guess which side of this fence is off-limits to deer? Spring wildflowers and oak seedlings may become more abundant at Rock Creek Park as the deer population is thinned. Photographer: Erin Jones, courtesy of NatureServeAt Rock Creek Park, an exploding population of hungry white-tailed deer over-browsed herbaceous plants and little woody tree seedlings or saplings in the 1990's and up until 2013, with multiple effects. Some natural communities are hard to recognize at Rock Creek Park because of high deer browse. Natural communities such as the Basic Mesic Hardwood Forest or Mesic Mixed Hardwood Forest that should be rich with wildflowers have very few of them. What does this loss mean to butterflies, bees, and other pollinators and would-be herbivores? In the Mixed Oak / Heath Forest, hillside blueberry and black huckleberry shrubs are often grazed down to mere inches, instead of growing knee-high to thigh-high and producing berries. Map tip: to locate examples of these natural communities that you can visit, go to the interactive map of Rock Creek Park and search for "good places." Over-browsing diminishes the availability of important understory habitat for animals. Many sensitive species of songbirds cannot be found in areas where the protective understory has been removed by grazing.4 Rock Creek Park has historically been an important stop-over in the migration route of neo-tropical songbirds, and the nesting ground of other migrants and year-round residents. When deer eat nearly all their favorite kinds of young tree seedlings and saplings, it impacts the ability of those tree species to regenerate themselves. This means that not only today's forest, but tomorrow's forests are being altered! Deer taste-preferences may influence what a forest will look like in the future. In Rock Creek Park, white oak seedlings are an apparent favorite of deer, with many other oaks a close second (not including chestnut oak seedlings, which the Rock Creek Park deer seem to to snub them unless particularly hungry). Oaks are slow-growing compared to other tree species, making their tender leaves vulnerable to deer browse for several years. Thus, many oaks won’t survive to maturity. Of course, many more oak seedlings germinate than could ever be sustained in the forest canopy , so it is a natural process for animal browse to limit the number of seedlings that make it to maturity. However, this balance has been upset at Rock Creek Park by the sheer number of hungry deer. A transition away from oak would not only change how the forests of Rock Creek would look, but of course it would also impact animals (including insects) that depend on oaks and their acorns for food and shelter. Many would be able to shift their dependence onto other available food sources such as beechnuts. A sharp decline in oaks, however, could change Rock Creek Park in ways we can’t even imagine. Things in the natural world are woven together in such complex ways that we can't trace every thread to see everything else it touches. A dense population of deer is often blamed for spreading tick-borne diseases, but in this case deer are not the main culprit. Natural resource managers for the National Park Service watch population trends. Sometimes in cases of sharp population growth or decline, after they have researched the situation thoroughly and sought expert and public input, they decide to intervene. Rock Creek Park is taking steps to manage the burgeoning white-tailed deer population. After many years of careful study and public input, in 2013 the park began to implement an approved deer management plan that uses combined lethal and non-lethal actions. The goal was to reduce the population density of deer to 15 to 20 per square mile (fewer than 8 per square kilometer)—a density that would allow the survival of enough tree seedlings to maintain regeneration of the forest, according to research.6 7 The target population density was achieved by the fall of 2015 in the main section of Rock Creek Park north of the National Zoo. Deer management action could also be extended to additional areas managed by Rock Creek Park, such as Glover Archbold Park, Battery Kemble Park, and Fort Totten Park. Map tip: To find these locations, go to the interactive map of Rock Creek Park and search on part of their names ("national zoo," "glover," "battery," or "totten"). It may take six or more years from the start of deer management operations for vegetation growth to recover to the point where forest regeneration is sustainable,8 but there is now new hope for the next generations of oaks, wildflowers, and shrubs in Rock Creek Park's natural communities. 2. National Park Service. 2013. White Tailed Deer Management. 3. National Park Service. 2016. Frequently Asked Questions about Rock Creek Park’s Deer Management Plan November 2016 . 4. Carruthers T, Carter S, Florkowski N, Runde J, Dennison B. 2009. Rock Creek Park Natural Resource Condition Assessment. 6. National Park Service. 2016. Frequently Asked Questions about Rock Creek Park’s Deer Management Plan November 2016 . 7. Carruthers T, Carter S, Florkowski N, Runde J, Dennison B. 2009. Rock Creek Park Natural Resource Condition Assessment. 8. National Park Service. 2013. White Tailed Deer Management.